Given the cynical over-hyped world we live in, there are few experiences today that really live up to their image. One of those that do is a visit to a Christmas market (German: Weihnachtsmarkt or Christkindlmarkt) in Vienna. Use the list below to find your way around the different markets, discover which ones are best and get a few insider tips on how to make the most of a market visit. Imagine crisp winter air, even crisper snow, the glitter of a thousand candles, steaming mugs of punch, laughter, smiles, roasted chestnuts, the tinkle of glass baubles and the delicate crafts of a hundred artisans. Now throw in the scent of baked potatoes, fresh bread, strudel, candied nuts and more. Then spread it all out in front of a magnificent Baroque palace. The dictionary definition is a collection of wooden stalls during the weeks leading up to December 24th (and often beyond), with a mix of stands selling traditional Christmas foods, decorations, art and crafts, handmade toys, honey and other delicacies, candy, jewellery, and so on. That rather clinical description fails to do justice to the concept, though. In recent years, the Vienna authorities have worked hard to ensure an almost complete absence of tackiness from proceedings. Today’s Christmas markets are mostly a tasteful affair, where plastic is rare and wood, straw, glass and fabric (and enough food and drink to kill an elephant) dominate. Though they’re worth visiting just for the atmosphere, the markets also make for excellent shopping. You’ll normally find a range of potential gift items: carved flowers made of soap, Victorian-style candy, sculpted candles, handcrafted decorations, wooden nativity scenes and much, much (much) more. 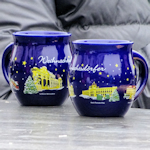 There are many Christmas markets around, varying in size from a couple of stalls selling food to the hundreds of stalls that make up the famous Christkindlmarkt on the Rathausplatz. There’s even a city walking tour* that takes in four of the bigger ones. The only downside is they can get busy – fighting your way through the latest bus group can take the edge off the romanticism (but see my tips for advice on when to go). Winter im MQ: sort of the nightclub version of a Christmas market. Not a carol in sight, just a collection of outdoor bars in the main courtyard of the thriving art complex that is the Museumsquartier. Wintermarkt am Riesenradplatz: food and drink stalls only, and right next to a circus and funfair.